No more hassle and expense with compromised, tricky products, with moving parts. There have been a number of attempts over the years to solve the enduring plasterboard fixing problem – some more successful than others. Finally a next generation plasterboard fixing with all the advantages and none of the drawbacks. Drill. Grapple. Fix. All plasterboard thicknesses, including double thickness boards – it doesn't matter! No protruding front flange therefore easy to cover. Fixtures finish flush with plasterboard – no gaps! 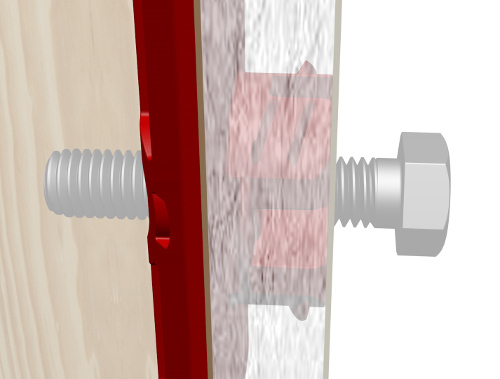 Grapplefix represents a significant breakthrough in heavy duty plasterboard fixings. They are designed to be simpler (and therefore cheaper), quicker to install and stronger than the current leading designs, some of which have significant and fundamental shortcomings. For example, they sit on the front render and require a front retaining flange to prevent loss into the cavity, which prevents items from being attached directly to the plasterboard. This is problematic both from a cosmetic and structural perspective. Most struggle with more demanding ceiling installations, which require additional strength under lateral (“pull-through”) load rather than just in shear (e.g. downward force in a wall) and where more than one bolt may be required. 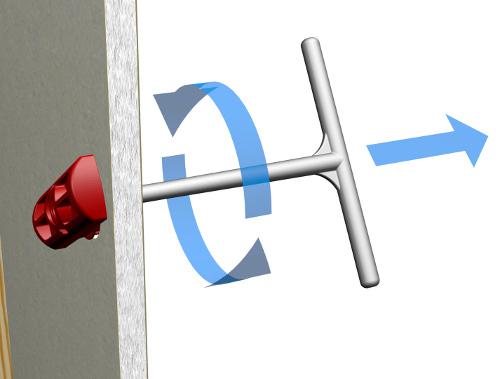 Grapplefix utilises larger hole sizes to prevent "tear-through" but also exploits this access opportunity to enable not only a back plate to pass through (as with the current captive-toggle devices) but also (and uniquely), an attached chamfered circular boss, which sits securely in the back of the board. Grapplefix therefore not only benefits from a full-sized back plate, but also an over-sized boss that prevents “tear through”. However, because the boss is integrated, there is no need for a toggle or front retaining flange and this combination is what makes Grapplefix uniquely strong in both lateral and shear planes. The fixing simply screws (self-taps) into the rear of the plasterboard and is retained by the back plate itself. The surface area of the fitting sitting behind the board is very small (typically 1-2 cm2 ) – less than adequate for more critical ceiling applications and prone to lateral "tear-through"
The integrated boss sits in the back of the board, not on the render. That's a first! Universal fixing – all plasterboard thicknesses, including double thickness boards – it doesn't matter! No moving parts – no adjustments, no failures, no worries! Fully reusable and recyclable (you may have to clean it up a little). 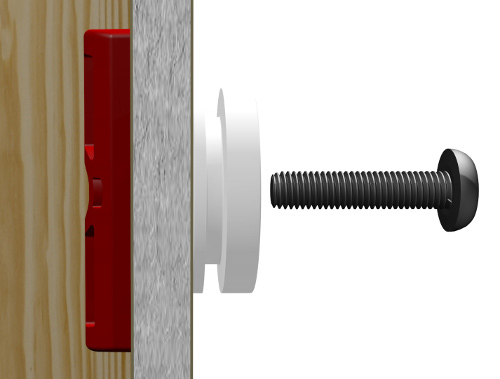 Doesn't drop inside the cavity when the bolt is removed – it has to be unscrewed from the plasterboard! There is one group of fixings that also employs a back plate fed through the plasterboard hole. 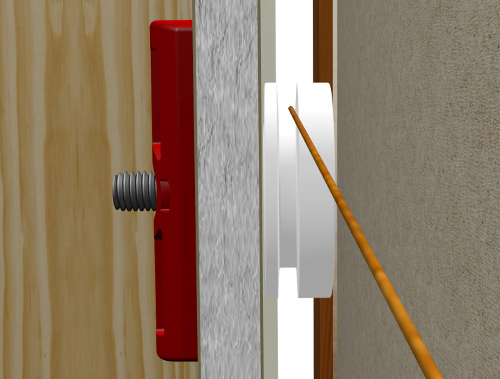 These have been around for a while and utilise some form of toggle (usually a nylon string or strap) to hold the back plate in place while a front facing boss, retained by the toggle or toggles (sometimes there are two, one either side of the boss) is slid into position into the front of the plasterboard. Like Grapplefix, these fixings have some advantages as the back plate has a substantial surface area. The front facing (detached) boss requires a front retaining flange to prevent over-insertion into the plasterboard hole. This type of fixing therefore exhibits most of the drawbacks of other front facing fixings (albeit with a superior back plate), which sit on the unstable render and do not allow attached items to sit flush against the plasterboard. 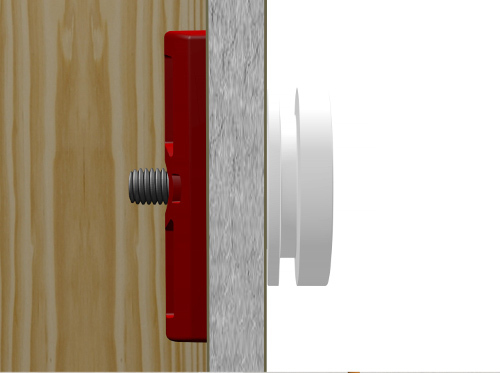 Grapplefix has replaced the requirement for a toggle, by using an integrated boss that can be screwed directly into the rear face of the plasterboard! We recommend that you use the supporting wall behind the plasterboard. It's the most obvious, cheapest and strongest solution. There are frame products designed just for this purpose. The Grapplefix design has been subjected to a Finite Element Analysis (FEA) study to ascertain loading capabilities (including thread stripping) in different planes (representing wall and ceiling applications) analysing the relative performance data of shortlisted structural "metal replacement" polymers. Although considerably more expensive than standard Nylon 66 or POM (Acetal), the Glass Filled polymers we have chosen have outstanding tensile properties and importantly, protect against creep over time under static loads. IMPORTANT: Using standard self-tapping screws or threads in unfilled ductile plastics such as Nylon or POM (Acetal) is also inadvisable as they may fail over time. Grapplefix passed certified FEA testing at a loading of 150 Kg (this was set as the initial boundary condition) for all applications, including the ceiling application. 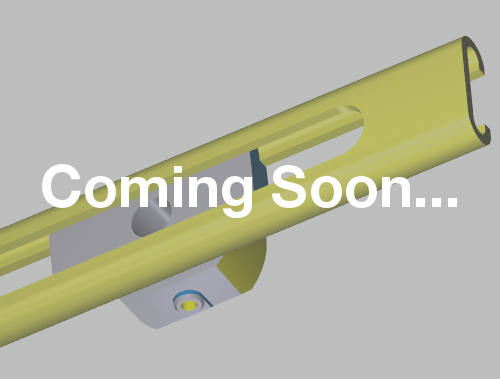 The 150 Kg loading parameter fell well within the calculated "safe" tensile modulus, which also takes into account factors such as moisture, test uncertainty and material processing e.g. fibre orientation. These factors, when taken as a whole effectively halve the "break point" tensile modulus. In other words the "safe" modulus is approximately half the value of the "break point" modulus. The fixing also passed for creep with minor permanent displacements and with permanent displacements after 11 years (100,000 hours) of continuous application of the static load well below 1mm. It should be noted that load ratings for plasterboard fixings can be highly misleading as there are many site specific variables that determine actual performance in situ. For example, the type of bracket being used (on the front of the plasterboard) will determine overall performance as will the thickness of the plasterboard. 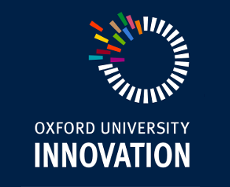 Grapplefix Limited is supported by Oxford University Innovation Limited, which is wholly owned by Oxford University. The University's innovation strategy states "We aim to be a world-leader in research-led innovation and enterprise creation through collaboration with external organisations"
We are here to help with any questions you may have about our products or queries regarding this website. We can be contacted by email or phone. Please note you cannot purchase products directly from us either over the phone or via this website. © 2016 Grapplefix Limited. All rights reserved.